The second set of the Northern Dogs annual spring vet clinics are just about to hit the road. For the sixteenth year, the vans are packed and ready for the two-day drive to the two northern communities we will be helping this trip. Every year we provide much needed vet services to communities who are hours from a vet clinic. Our first three clinics earlier this spring were a huge success – we spayed and neutered 110 dogs and vaccinated almost 330 dogs. It’s wonderful to see the same dog guardians year after year with their dogs (and cats), most of whom are still sporting their thick winter coats. While the intent of the project has always been to help owners keep their dogs healthy and to create a stable, vaccinated population in the community, not everyone wants to keep their dogs. A dog who we named Fran was one of those dogs. Fran was already outside of the community by the time she was picked up by the mechanic who works on the trucks at the local pulp and paper mill. She had obviously been on the lam for long enough to prove that her survival skills weren’t up to par. She was emaciated. Trying to survive in the bush as a domestic animal, let alone in the dead of winter, is no small feat. Dogs depend on people to provide for them and while your dog may catch a squirrel or chipmunk at the park, no dog can live off that. I said we would be happy to take his dog south to find her another home. We exchanged information and I told him when we would be leaving so that we could come by and pick up our newest travelling companion. We popped her into her cozy crate and carried on to pick up other dogs who would also be making the journey. On that first day of our trip home when we are picking up dogs to go south, we only travel about five hours before stopping at the local SPCA to take advantage of their big outside pens where we can let the dogs out to stretch their legs and have dinner. This is when we noticed that this beautiful dog was not just pregnant, she was very pregnant. When it was time to put her back in the van, we didn’t put her back in her crate, but cleared out the area along the side of the van to prep a warm, private spot for her to give birth. We made sure the dogs in the crates along the other side of the van were covered and left her in peace. At 5:30 the next morning there was a knock on my door. Margaret, long time Northern Dog team member, wanted to see if any pups had been born overnight. We tiptoed up to look in the back windows of the van – no dog! We went around to the driver’s side and sure enough, there she was on the front seat of the IFAW van having her pups right then! Two little blond pups were already there on the seat plus one little black guy who seemed to have been the latest to arrive. 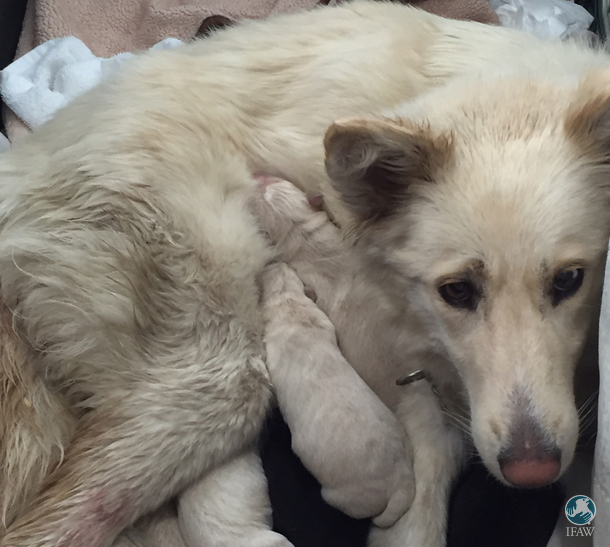 She had three more healthy pups to round out her beautiful family. Last year when we got the IFAW van, we named it Fran. And so it seemed only appropriate to name this wonderful girl — who had beaten the odds and survived over the winter in the bush to have her pups in a van — Fran as well. Fran has been an amazing mother to pups Jan, Ann, Nan, Van, Stan and Dan. And of course we will come back from this set of clinics with new stories. Stay tuned! Learn more about the work we do with dogs around the world.